Ephemeral New York, founded and edited by native New Yorker Esther Crain, chronicles a constantly reinvented city through photos, newspaper archives, and other scraps and artifacts that have been edged into New York’s collective remainder bin. Here we remember forgotten people, places, and relics of the way New Yorkers used to live. We get a big kick out of present-day urban weirdness and idiosyncrasies too. This site has given rise to two books, 2014’s New York City in 3D in the Gilded Age and The Gilded Age in New York, 1870-1910, set for release on September 27, 2016. The years between the Civil War and World War I were the most dynamic in the city’s history, and this is a favorite time period for readers of Ephemeral New York as well as the site’s creator. The Gilded Age is when the physical city we view and experience today came together: five boroughs sharing a magnificent waterfront, threaded by bridges and subway lines, with an urban landscape marked by skyscrapers, parks, and brownstones. The contradictions and extremes of the Gilded Age also make it such a fascinating era. Marble mansions lined Fifth Avenue a streetcar ride away from the airless flats of East Side slums. Upstate water piped into the receiving reservoir in Central Park offered fresh running water, yet it wasn’t until 1901 when tenements were required to have bathrooms in each apartment. Votes were purchased, prostitution was out in the open, and despite the wealth and glamour of Caroline Astor’s fabled 400, two brutal recessions made the Gilded Age one of bracing hardship for thousands. The Gilded Age in New York, 1870-1910 is available for preorder now on various book sites. Find out more about the book and Esther Crain on Amazon and Goodreads. Ephemeral New York focuses on all eras of the city’s history, but Crain herself vividly recalls the mid-1970s, when daily life for a kid in Greenwich Village meant stepping over winos to enter the Grand Union on Bleecker Street, a happily chaotic class packed with 35 other first graders at PS 41, and that Mays, not Whole Foods, was once the flagship shopping destination of Union Square. Sometimes wry and often wistful, she feels the presence of the city’s ghosts everywhere. All comments and (gentle) suggestions are welcome. This is one of the most fascinating blogs I have ever seen. I’m hooked. CA – Caledonia; PL – Plaza; WI – Wickersham; BU – Butterfield; RE – Regent; EL = ElDorado; BR – Bryant; MU – Murray Hill; VO – Volunteer; RH – Rhinelander; TR – Trafalgar; WI – Wisconsin (I know, I know, there are two WI’s listed – Wickersham and Wisconsin — maybe it allowed people to decide which side of the big pond they wanted to align themselves with); ST – Stuyvesant; GR – Gramercy; PE – Pennsylvania; BO – Bogandus; LA – Lackawanna; CO – Columbus; LE – Lexington; AC – Academy; ME – Medallion; AS – Ashland; LO -Longacre; AL – Algonquin. I only saw one reference to WI as Wisconsin, so maybe that was a misprint. One thing I’ve learned in transcribing the hundreds of newspaper articles on local history is that very little proofreading was done; however, in the defense of those who chronicled history for us did not have the luxury of spell checker and correcting things on the fly. My grandfather was the Washington Editor for the NY Daily News and I remember a Christmas Eve visit with him to News’ typeset section on 42nd St. Woe be unto the writer who suggested that the midnight run of the paper be held up to correct a mistake. If I run into any other phone prefixes, I’ll send them your way. If I have the time, I will scan some of NYC ephemera I have and forward them on to you. Do you have a methodology in place for readers to upload files to you? Well, this is incredibly embarrassing. I failed to proofread the sentence in which I remarked that writers of yore failed to proofread their work. Believe it or not, I am one of those people who subscribes to the adage that those who fail to understand history’s mistakes are bound to repeat them. I need to go to sleep. Looking at the window above the man’s head, it would appear that the building served as a church at one time and that the writer depicted represents one of the many scribes of the early Christian church. I’m thrilled that you like the site, and thanks for all the great info about the phone exchanges and the origins of the man writing by candlelight on 14th Street. A church does seem like a possibility. I live a block away from that doorway, so I’m going to look into it. I will be adding a general email address for the site soon, which would probably be the best way to send some ephemeral images. That Talbot County site sounds really neat. I went to college in Delaware, so I’m familiar with Maryland’s Eastern Shore and the Delmarva Peninsula. It’s an odd, sort of ignored corner of the country. Uncovered an interesting piece of NYC trivia the other day that I thought you might find interesting. In my post regarding the phone prefixes there is mention of the prefix ‘LO’ for ‘Longacre’. In all my years in New York, that was a new one for me and I found myself unable to arrive at any obvious explanation that made it signficant enough to be assigned as a phone prefix. With many other research paths demanding my attention, I condemned ‘Longacre’ to the unsolved mysteries section of my brain and moved on. Well, lo and behold, whilst browsing a collection of old NYC images last evening the meaning of ‘Longacre’ and why it was considered a worthy phone prefix became clear. Apparently, up until about 1904 Times Square was called Longacre Square. Forgive me if this is ‘old news’ to you. Thank you so much for this labor of love. This is a wonderful site with so much fascinating information. I moved to New Jersey when I got married and ever since then I’ve fallen in love with the city, and because I am quite obsessed with history, I’ve also been studying New York’s past. I will definitely be back and will most likely spend a lot of time here! Thanks for all of your work on this site. Thanks so much for your kind words. And welcome to the tri-state New York area! well, it took me long enough. but here i am with some downtime at work (finally) and traipsing about your site. it’s totes fun. I don’t know if Liz Lee is still reading this blog (her post is dated last June) but what she doesn’t seem to know is that WI could easily be both WIsconsin and WIckershom because the exchange depended on the following digit. WIsconsin 7 (which lasted as long as named exchanges did) and WIckersham 2 (wjich went away in the mid 1940s) both coexisted. Later after WIckersham 2 was abolished, WIlliams 2 was set up. Take a look at http://phone.net46.net/nyc for more details. Love your blog! As a graphic designer, I have always been fascinated by vintage signs, ephemera, ads, street shots, buildings, etc., especially in New York City. I was never lucky enough to have actually lived there, but I have visited over the years, and blogs such as yours helps immensely to capture the whole atmosphere, both past and present. Keep up the wonderful work! Thank you so much. As you can tell, I love those old signs and ads too. Brilliant blog. Thank you for preserving the ever-fading past of this great city. A fantastic site!!! I’m a native, know a good bit about basic NYC history and do a lot of bike riding througout the five boroughs. Your site does an excellent job of “filling in the details.” Truly wonderful! Keep up the great work. Thank you for the praise…especially meaningful as it’s from a homegrown New Yorker. I’m a native Brooklynite now living in Europe (for a very long time now). Your site is great! My personal interest is in old time Brooklyn ice cream palors. Somehow, they were just a special world for me. Any idea where I can find information about them? They seem to have disappeared forever. Thank you. Thank you for the kind words. I don’t know where you can find info on ice cream parlors except to browse sites such as forgotten-ny.com, lostnewyorkcity.blogspot.com, and vanishingnewyork,blogspot.com. It’s a great idea for a future post here. great stuff as always e. i check in all the time. we need to get together soon. I’ve been living in exile in Iowa for the past 50 years…still a New Yorker at heart. My parents immigrated to NYC in 1948 when I was six. We lived on York Ave. and 67th Street and across the street was “The Gardens.” It worked like a public library; children joined, were assigned a 5×3 foot plot of land, and were helped to plant five vegetables. There was some kind of clubhouse with books on nature etc. I recall that the only thing that grew to more than a two-inch long carrot was SWISSCHARD. We had little-kid wagons full of it and would go from door to door trying to unload it, but the ethnic groups who lived in the apartments, mostly Irish and Polish, were not so enthusiastic about it. What on earth was all this about? Left-over victory gardens from the war? Some social work thing aimed at immigrants? If anyone knows, please email me! I’ve been on here for a couple of hours and could stay on all night; I’m hooked. Just got back from a weekend in NYC (my birthday request for 9-11) to my 300 year old house in PA; I love both NY and history. Will be back often! I just found your site and I love it. I left E. 28th St & Lex. in 1987 to upstate, and have not yet adjusted. Still a New Yorker, and proud of it. I recently had an essay published in the local college literary mag about a trip I took from my growing up neighborhood to Times Square. I can send it, if you like. A cutesy coming of age story.. I was actually searching for a reference to the Hotel Lafayette and the long gone Hubert’s Museum on 42nd St. I am an antiques dealer and I have 1000’s of pieces of paper (they don’t use the word ephemera up here), and I will pay more attention to NYC items in the future. Thanks for the blog and the site. I’ll be back!!!! Donna, thank you so much. I hope your trip to NYC on 9/11 wasn’t a total washout. Alan, sure, send your essay! It’ll give me great ideas for new topics to cover. Hubert’s in Times Square is a good one, I’m going to post something on it soon. And if you have any interesting ephemera for sale I would love to take a look. Just wanted to tell you that I love this website! Just wanted to add that I also think your site is unique and extremely interesting. I enjoy visiting often and almost always come away with a growing curiosity about our fair city and its ghosts. Just moved into town and love reading up on history, great site and amusing. keep it up and keep lots coming, looking forward to it! Thanks! And welcome to NYC! This is such an amazing sight. thank you for creating it! I am a native New yorker born in 1961 and I have lived here all my life. I am constantly assaulting friends and family with tales and explanations of how much things have changed. i grew up on *7th and CPW and I remember when there was not one restaurant on Colombus or Amsterdam Avenue and when I had to be careful walking to Broadway–some blocks were pretty dicey. I am trapped in the neighborhood by my rent controlled apartment but I liked it much better back in the day.And here’s a funny fact to share. I am “The Papaya Princess” My dad owns Gray’s Papaya and I worked behind the counter as my first job when I was 15, somebody has to do it right? I will pass the word along about your sight. Wow, thank you! Your dad owns Gray’s Papaya? That means you’re NYC royalty! Have I asked you this before? We came to NY from Switzerland in 1948 and lived on York Ave. between 66th and 67th. “The Gardens” was right across the street — kids could join, like the library, and be assigned a 3 x 5 foot plot of land to till and plant vegetables. We would go tend to this plot two or three times a week. There was also a nature library of some sort. As I recall the only thing that ever grew was swiss chard – we had wagons of it at harvest time, along with a few microscopic tomatoes and carrots. We would try to peddle the swiss chard all over the neighborhood, but hardly anyone even knew what it was. I love your site and curse you for giving me yet another distraction from work ( I can get lost for hours) I grew up a half a block from Washington Square and went to Little Red (aptly named). I photographed New York for many years and run a photo website called New York Stock Photo ( http://newyorkstockphoto.com ). Just thought I would offer my work to your blog if you should ever find yourself in need of a current photo of a particular subject. Since I represent other photographers, simply enter in the keyword and add my name to the search, *(example – hanging elm peter bennett). Let me kow and I will send you an unwatermarked file of it. Thank you so much for the kind words! I know Little Red; it’s not far from PS 41, where I attended a few years of grade school. I’m going to look through your photo website once I get out of work for the day…. I went to PS 41 for about a month, but a lot of my friends went there and then on to IS 70 and Seward Park HS where I graduated from in 1972. Love this blog!! I have spent hours here today reading, just found this last night. I love your blog! It’s great learning little things about NYC spots that I usually just walk by without noticing. Makes me feel like I know the secrets of the city! Really cool. I just discovered Ephemeral New York via Ed Burns’ Twitter feed and now I’m hooked. Fascinating tales beautifully written. Thanks so much. I love your blog! The archival photos are terrific. You delve where most of us glance and wonder. Thanks! I really enjoy your blog. In your intro, the line about the “ghosts of the past” — I really feel that sometimes and you blog really helps to pin down the tiny details that evoke that feeling. I have lived here since 1981 and the change even since then seems enormous. Glad you like it! It’s nice to know that there are so many New Yorkers who also sense the ghosts of the past. I found your blog quite by accident and just wanted to say how much I’ve enjoyed reading through it. I was born & raised in NYC, but have lived elsewhere for many years. This brings back so many lovely memories, and the photos of old time New York are fantastic, as well as stories about the city that I’ve never heard – and that have caused me to Google to find out even more. Makes me wish I were there so I could check things out in person. Thank you so much! Thanks–I love hearing from born and bred New Yorkers. Feel free to suggest any post ideas I may not be addressing. i just came upon your site and find it fascinating. i’m adding it to my favorites. bookmarked! i’ve only had the pleasure of visiting new york city once so far, and i can’t wait to go back. Fascinating blog, truly. Was looking to get a feed of it somehow on Facebook. Is that possible? Thank you! Soon the Facebook page will be in shape–in a few weeks I hope. Love your site! I’m going to list it as a favorite on my site. I am from RI, but have always felt an attachment to early New York history. The photos are great. NYC is an amazing place to visit and I wish I could get there more often -it’s been about 5 years :(. I love your site! Thanks for this fun weblog. A Google search for the German restaurant on 14th St in the 1960’s brought up the name Luchows and a link to your site. I read the info then went on to read more and more and more. I was born in Bklyn in 1938 and lived there until 1987. My entire worklife was in the boroughs. In 1995, after having retired 2 years earlier, I moved to Apache Jct, AZ, about 30 miles east of Phoenix. Since that time I’ve been in search of food to compare with what I was used to in NY; all the delicious variety and flavors. Ther is no really great Italian, Chinese or Greek food here. We travel a bit for good kosher deli, the bagels are OK but not NY. There is NO appetizing store to compare with Russ & Daughters or Zabar’s. As a birthday gift for my partner I ordered bialys, smoked fish, pickled herring in cream sauce and ruggelach to be shipped by Russ & Daughters. We invited a couple of friends who we knew would appreciate those “delicacies” and it was one great brunch. Thanks for your delightful and fun site. Thank you for your kind words. I love the Arizona desert, but yeah, it’s not an easy place to satisfy your cravings for kasha knishes and smoked salmon. This is great. I would like to receive updates. Wow, this is such a cool blog. I’m a native New Yorker living in China right now…so whenever I miss home, I come to this site. Please keep it up! I especially love the bizarre deli names tag. The deli of life. Ha! Thank you! Nice blog you’ve got there as well! Love this site. Thanks so much for sharing the info and insights. I’m sure you’ve probably read Luc Sante’s “Low Life” — but if not, drop everything (except Niblet) and grab a copy. Thanks for the kind words! I agree, Low Life is wonderful, illuminating. It’s at the top of my NYC reading list. Check it out when you have a minute, I think you’ll really like it. Thought you and your readers might be interested in our 19th-Century Pub Crawl app, which you can see at touchscreentours.com. i actually don’t have a comment (other than WOW) but would like to receive updates. thx. Thanks! Hit subscribe and you will receive updates…or just check back every couple of days. What is your policy on using one of your photographs for a book cover. Great site! Thank you! Depends on the photo. You can email me with more specifics. I found your site in a search for F. Scott Fitzgerald’s essay “My Lost City.” Your insights into past and present city “imaging” will interest students who are in my urban studies program at The Evergreen State College; they are presently on field studies in a number of cities. This blog is truly amazing…..I LOVE new york and I am always looking for books about its history, this by far beats any book I say!!! Over this past week, everyday without fail I have been looking backwards through this blog……..I am addicted to it already. So interesting, will carry checking daily for your updates!!! Thank you! I had no idea the Webster was so spooky. I’ll have to sneak in there one of these days…. I’m looking for information on neighborhood settlement patterns related to Irish immigrants who arrived mid-nineteenth century, stayed in Manhattan a while, then moved to Brooklyn. Can anyone recommend books or studies that would give me an idea of how the Irish spread out through the larger metropolitan area. I’m especially interested in where the all-Irish neighborhoods were and when and where people started to move into more mixed neighborhoods. I would appreciate any information anyone might have. Thanks to all. here’s one very small tidbit I know of; a 19th century developer named John Jackson hoped to attract Irish immigrants to an area of downtown Brooklyn by naming it Vinegar Hill after the Battle of Vinegar Hill from the Irish Rebellion of 1798. The neighborhood is next to the Brooklyn Navy Yard where many of the residents worked. It is now a fraction of it’s original size due to highway & housing development, but it has retained many of it’s original 19th century houses & streets. It has unfortunately also attracted the attention of hipsters from nearby DUMBO, so there’s probably few old timers left. I was looking for blogs about New York and its history, and I’m so glad I found this one! NYC has such an interesting past, and I love the quirky, almost-forgotten things you’re posting. I will definitely be a frequent reader! I have been linking a number of your posts to a Facebook group I am part of called “Greenwich Village Kids from the 1960’s”. I’m not usually a participant of these type of nostalgia groups, but this one struck home with me a year or so ago when it started. More recently it has taken off with thousands of posts from many new members and offered a really colorful and rich picture of what it was like growing up in GV in a time when the rest of the world was in many ways reflecting what had started in what we called our own backyard. I know you grew up there or at least spent part of your childhood there. For all I know, you may already be a member of it, but if you would like to join I would be happy to enter you as a member. Fear not that this is some surreptitious method of extracting your name from anonymity (although I am curious), I would certainly protect it. But if you are interested, you can get in touch with me by email at pb@ambientimages.com and let me know. In the meantime I will continue to post all relevant posts to the group and hope it directs some interested parties your way. Thanks for your tireless hard work, I can’t tell you how much this transplanted New Yorker and GV’er enjoys each and every new post. Great site – very informative. I am working on a study of media evolution in Times Square and was wondering if you had any sources you could share. The blogsite is “McluhanTimesSquare@blogspot.com if you’d like to see more. I’ve just spent the last week going through your site and cross referencing with other sites. I grew up in Brooklyn in the 70’s and 80’s, and now live in Virginia. If I could afford it I would love to retire back to NY. Keep up the good work! I’ve spent the past couple weeks ogling over your wordpress. I’m fascinated. I’m obsessed and would love to have more! I’m done with all 131 pages! More more more more more please! Thanks for ogling! I wish I could update it every day, but you know, the whole day job thing prevents that. Thanks for the site. I love the old photos. Not to take anything away from the fantastic “Forgotten NY” site, but I love the more informal atmosphere here; and the information is just as dependable and fascinating. Great stuff. Thank you so much! There are so many great New York websites out there, and I like to think each one has its own unique insight and angle. I love your site! New York has so much history to offer and it’s all written on your blog! Great, exactly what I’ve been looking for and could never find… Thanks from a newbie! i was wanting to check o a metal chest of drawer that can from this company. I love your site…I can linger here for hours! I was wondering if anyone here knows where the park dedicated to Ethel Merman’s parents is. I remember seeing it somewhere downtown. Any ideas? Thanks! I’ve never heard of this park. Anyone know? Thanks for your blog. Ive been reading it for years and always come here to relax, its like a teeny vacation for my brain where I also learn something really cool. Thank you so much–that means a lot to me! This is a fantastic site. Please have a look at the Frank Larson New York street stories photo exhibt that just opened at the Queens Museum of Art. Wow, these photos are magical, fantastic. Thank you so much for sending me this link. The exhibit and Larson himself need to reach a wider audience. In your April 23 entry, you refer to “a wonderful book, “New York Then and Now”. In reseraching this title on Amazon.com, it seems there are several books of that name. Which one did you refer to? Not sure this posted the first time. Wondering if you have ever looked into anything about the history of New York’s swimming community and particularly the open water swimming. I don’t see an email for you so I am leaving this here. I have a Zuchotti Park street sign mystery for you. I recently noticed a street sign situated in the center of the north side block (Liberty St). It says Temple Court. I didn’t notice this there before. There is no existing street path there. A giant building is on the other side of Libery Street. So I looked it up. The only Temple Court as a street I can find is actually my neighborhood in Brooklyn. In Manhattan, the only thing I can find identified as Temple Court is the building at 5 Beekman Street (which interestingly was the building in which my grandfather owned his first tailor shop). So unless I am hallucinating this sign, please help if you can! I’m intrigued by the street sign–I’ll have to go down there and check it out this evening. Thanks for letting me know. Could it really be an old-school NY sign? I love Ephemeral New York, just discovered it a few days ago and have already written all my friends and family and sent your link. Thank you for hosting such a wonderful site! Great site! I will definitely look through it more, I am particularly interested in 1960s “candy stores” (Manhattan) that sold comics. Also, I know it’s been years since Liz’s first post above so perhaps the answer has been since posted, but I believe the phone prefix WA stood for Wadsworth (my grandparents in Washington Heights had a WA number). I think your New York is beautiful. I love the old buildings & the wonderful cemeteries.. Thank you for the chance to enjoy it all. I just discovered your website when I was looking for information on the Hotel McAlpin. It’s the most interesting and beautiful website I’ve ever seen and I wish you would make it into a book or several books. This site is fantastic and I am hoping that you would post a little ditty about our upcoming auction. On March 24, 2013, the caricature collection from the estate of George Wachsteter (1911-2004) will be offered. This remarkable collection of Illustrations and drawings, mostly from the illustration board layout for the New York Journal American TV Section Cover, include almost every notable face of the 50’s. Please let me know if you have any questions. Thank you again. Thank you for an amazing blog! I stumbled over it by accident while gathering info on the history of NYC and found a lot of posts helpful and interesting. Fun, captivating and many linked excellent leads to more resources on the net. I was just out researching the New York Hebrew Orphan Asylum, as I had picked up a scrapbook with a football game schedule listing all the kids names and ages from 1936 between the HOA and the BHOA. Just very happy to see a sight that loves paper as I do, and the preserving of it. Keep up your good work. And if there is a way to leave jpg of this item for your archive let me know. I was born and bred in New York and I absolutely love this fabulous city. I can’t remember how I found you, but it was a fortunate day for me. Now retired, I can take leisurely jaunts around town, so thank you for all this incredible information and day trip ideas. Just love your blog. That means so much to me–thank you! There is a huge building complex in the Bronx on Tremont Avenue that has the most amazing reliefs/ornamentation, is that the right word? Over one door is a small child holding a doll, on the corner of another building is a skier coming off the building, another, a man under an umbrella. Mothers playing with their children. Each building has different characters and it seems none are repeated. I took a batch of photos when I was up there, I’d be happy to send you some. Sure, send them to the ephemeral gmail address. I’d love to see them and run them in a future post! Happy to discover this great site! Check out Hidden City, Philly. Sorry for the belated thanks. Hidden City is fascinating. Love this blog! It’s fascinating. Thanks Steve, feel free to suggest any ideas for posts! Nice look back into NYC history! Anyone ever hear of “The Alley” in the Bronx? Supposedly 151 Street, a one block street surrounded by Avenues? I have just discovered your blog. I have been tracing the evolution of NoHo from the 1830’s through a great deal of research over the last 20 years with the hopes of a book of plans, elevations and perspectives of then and now. I would love to share and talk after I finish the final elevations of Great Jones st. I grew up in Little Italy/Greenwich Village. I have been searching for pictures of the old movie theater on Bleecker St. between Sullivan and Thompson, around 1947 (before it became the Circle on the Square Theater). Have you seen any photos of this theater? I have not seen any in my travels! I grew up on 110th St. between Lenox and 5th Avenue. I was speaking to a friend and we were trying to recall some of the shops and restaurants in the neighborhood. We remembered Dreamland, the ice cream parlor at the east corner of 110th & Lenox, it was owned by Snookie Walker. But we can’t remember the name of the restaurant on 110th on the west side of Lenox. It faced the park. Can you help? So is there a method we can submit photos to you for consideration? I have a great one of men playing bocce on the courts that occupied the corner of Houston St and 1st Ave, c.1970. I am intrigued, E.N.Y. Who are you? A woman from the West Village. I’m the former Commissioner of NYC’s Dept of Records, so we must have met somehow, no? Drop me a note at BGAndersson2@gmail.com. DOes anyone remember a restaurant or cafe in the old coffee house tradition called Paris on a hundred and forty fifth Street and Broadway on the corner?I was there as a child in the early 1950’s. Then itclosed; my favorite dessert there was a slice of a rectangular buttercream mocha cake with shavings of almonds! perfection! Couldn’t read all the blogs, poor timing and just found this site. Is it still possible to follow this blog via email notifications? If do, how! How about the sprinklers set up in the fire lanes on hot summer days when the Thompson Street pool was too far to walk to? If you lived there in the mid-70s, we were neighbors! the 1950’s restaurant that is now Orsay on 75th Street & Lexington Avenue? Do you offer the manhole covers for sale? Looking to find a cover to use as decor. The blue building is not 8th and 39th, it’s 7th and 40th. I know this because I’m a New Yorker and, well, the street sign that in the picture. I believe this blog is/was/will be ephemeral. When I returned to Manhattan from Washington DC after WWII (1945), my parents’ apartment was a 2 Sutton Place South. 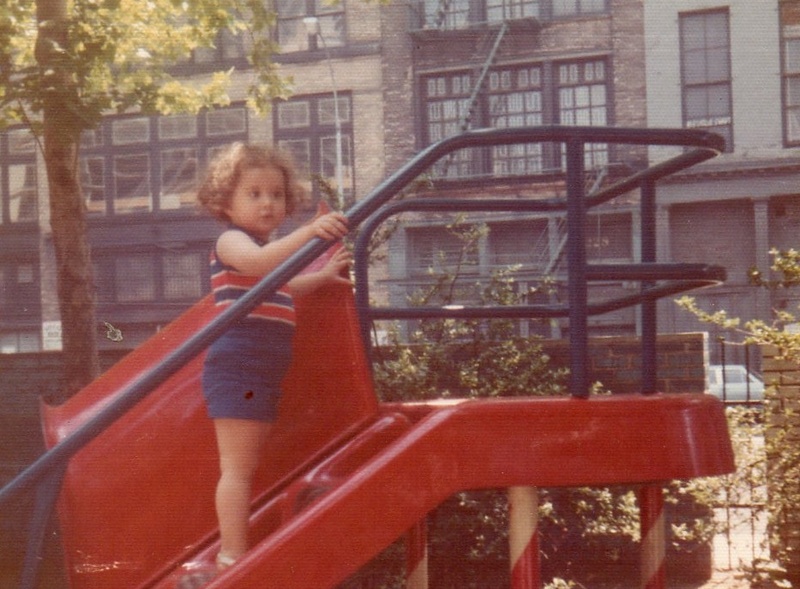 Not only was there a little playground at the end of East 57th Street but when it snowed it was possible to sled down the hill on undeveloped land towards the river from the east side of either 54th or 53rd Street. Do you have any record of this area at that time? Hi Catherine, I’m sorry it’s taken me so long to see this post! The little hill going down Sutton Place still exists, but the land toward the river has been developed into small pocket parks that are slender little islands of green. For more information on what it was like at that time, I’d go to the NYPL digital galleries or the MCNY digital collection. The parks department may also have some old photos or more information. Happy New Year and thank you for all you do! Thanks so much Brian, and happy new year to you too! Do you happen to have a post about this charming row of houses?